Many standard industrial waste treatment texts sufficiently address a few major technologies for conventional in-plant environmental control strategies in the food industry. But none explore the complete range of technologies with a focus on new developments in innovative and alternative technology, design criteria, effluent standards, managerial decision methodology, and regional and global environmental conservation specific to the food industry. Until now. 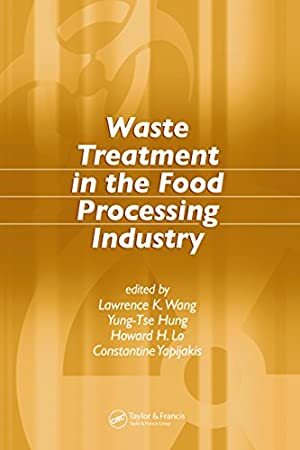 Waste Treatment in the Food Processing Industry provides in-depth coverage of environmental pollution sources, waste characteristics, control technologies, management strategies, facility innovations, process alternatives, costs, case histories, effluent standards, and future trends. It delineates methodologies, technologies, and the regional and global effects of important pollution control practices. The book highlights major food processing plants or installations that have significant effects on the environment. Since the areas of food industry waste treatment are broad, no one can claim to be an expert in all of them. Reflecting this, the editors recruited collective contributions from specialists in their respective topics, rather than relying on a single author's expertise. The topics covered include dairies, seafood processing plants, olive oil manufacturing factories, potato processing plants, soft drink production plants, bakeries, and various other food processing facilities. Professors, students, and researchers in the environmental, civil, chemical, sanitary, mechanical, and public health engineering and science fields will find valuable educational materials in this book. The extensive bibliographies for each type of food waste treatment or practice will be invaluable to environmental managers, or researchers who need to trace, follow, duplicate, or improve on a specific food waste treatment practice. Comprehensive in scope, the book provides solutions that are directly applicable to the daily waste management problems specific to the food processing industry. Track It. This book has been $69.96 within the past year. Log In to track Constantine Yapijakis on eReaderIQ. to be notified each time the price drops on any book by Constantine Yapijakis. to stop tracking Constantine Yapijakis. Log In to track Howard H. Lo on eReaderIQ. to be notified each time the price drops on any book by Howard H. Lo. to stop tracking Howard H. Lo. Log In to track Lawrence K. Wang on eReaderIQ. to be notified each time the price drops on any book by Lawrence K. Wang. to stop tracking Lawrence K. Wang. Log In to track Yung-Tse Hung on eReaderIQ. to be notified each time the price drops on any book by Yung-Tse Hung. to stop tracking Yung-Tse Hung. We started tracking this book on March 26, 2015. This book was $135.85 when we started tracking it. The price of this book has changed 117 times in the past 1,487 days. The current price of this book is $71.54 last checked 3 months ago. This lowest price this book has been offered at in the past year is $69.96. The lowest price to date was $69.96 last reached on October 31, 2018. This book has been $69.96 one time since we started tracking it. The highest price to date was $168.21 last reached on April 4, 2017. This book has been $168.21 one time since we started tracking it. We last verified the price of this book about 3 months ago. At that time, the price was $71.54. This price is subject to change. The price displayed on the Amazon.ca website at the time of purchase is the price you will pay for this book. Please confirm the price before making any purchases.